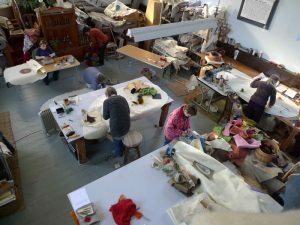 A unique, workshop for anyone open to exploring their relationship with their mortality through the highly creative medium of needle felting. You will learn some simple techniques, and can also bring your own skills, such as embroidery if you wish. You will have the opportunity to delve into your own creativity through words and imagery. You can expect to be gently lifted into a new way of thinking about Life. You don’t have to be a felt maker, religious, artistic, female, strong or old; but you can be any or all of these things! In other words, this may be for YOU! Until the last century, mortality rates during childbirth were very high, so women were encouraged to include their own shroud in their ‘marriage chest’. Fortunately, these days, and in this country at least, maternal death rates are low, and this workshop is designed for anyone who would like to just be prepared! 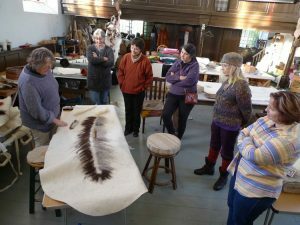 The focus is on decorating a coffin or shroud cover; something that reflects your life and passions, and that you can continue to work on if you wish. 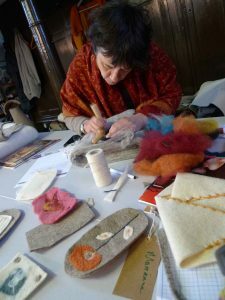 So why is it different to any other needle felting course? It’s about intention and focus. 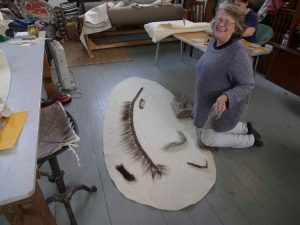 As a felt maker, I have been making shrouds for nearly two decades. 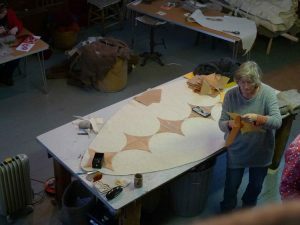 We will be working on large tables in my chapel workshop. You will be encouraged to gather imagery and materials that help you on your way to decorating a meaningful and beautiful covering, befitting to the person you are. This may be complex or very simple, or could be something that you would want to continue afterwards, and even to involve friends. There will be an intentional atmosphere conducive to talking about death, burial, funerals and ceremony, similar to the very popular Death Cafe movement, but with the possibility of the unexpected as we work, discuss, share ideas over a more extended period. Book and pay on-line – full amount or deposit.